The Gooiest Cheesiest Cheese Steak Sandwich. 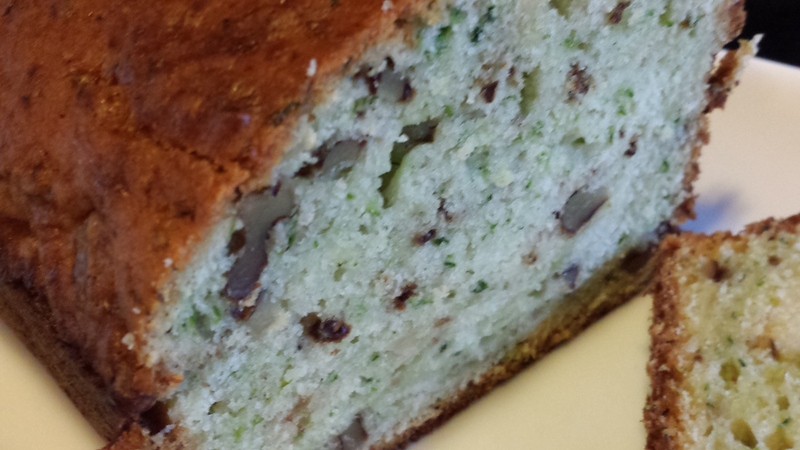 It’s a wonderful gooey cheesy and sometimes greasy treat. 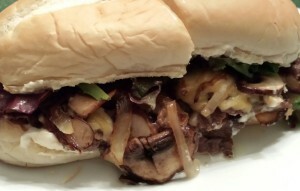 I make my cheese steak sandwiches with antibiotic-free steak and organic onions, mushrooms, and cheese. Sometimes I add organic bell peppers to the mix. It’s a good way to feel better when consuming lots of fat and calories! 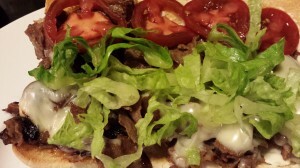 The Gooiest Cheesiest Cheese Steak Sandwich is sure to be a hit with your family! 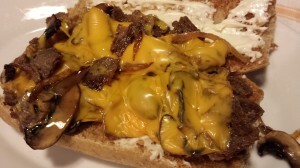 Sure, there’s an ongoing argument with the Cheese Steak Purists on what type of cheese to use (American, Provolone, Cheese Whiz), what goes on a cheese steak (peppers, onions, mushrooms), do you chop the meat or leave it in whole sliced steaks (chopped is most popular). 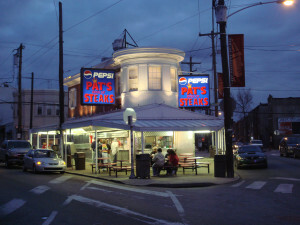 I’ve eaten at both Geno’s and Pat’s King of Steaks in Philadelphia where the Cheese Steak Wars are a daily feud. 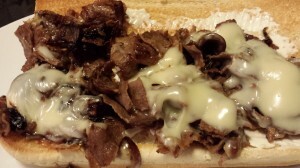 There’s an art to ordering your cheese steak sandwich at each restaurant which I guess is part of the charm. 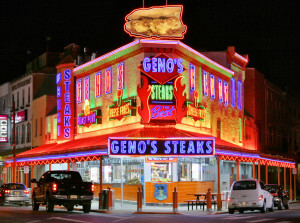 I didn’t get it right, and they yelled at me at Geno’s. 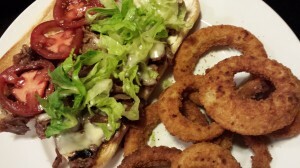 My favorite cheese steak includes chopped steak, sauteed onions and mushrooms, and white American cheese. 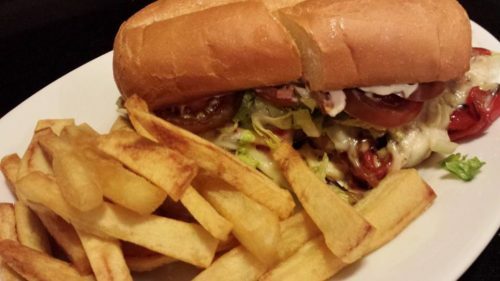 Add a little shredded lettuce and sliced ripe tomato, put it all on a toasted steak roll slathered with mayonnaise, and I’m happy. My husband prefers Swiss cheese on his cheese steak. 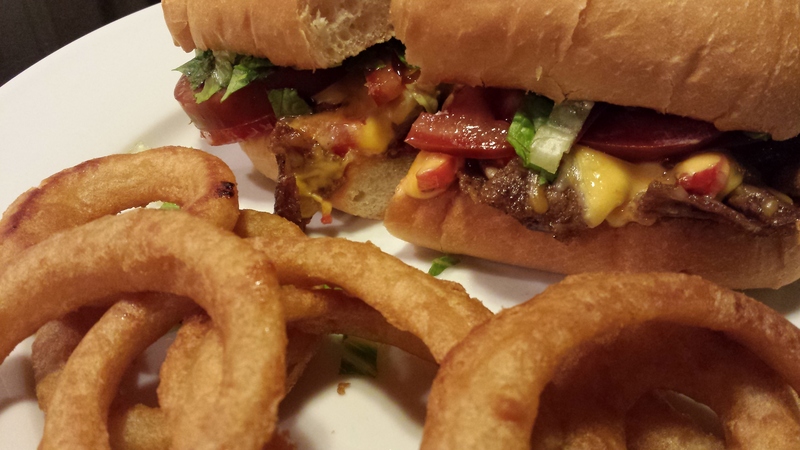 Don’t tell the Cheese Steak Purists about that! Let’s start out with some nice steak rolls. 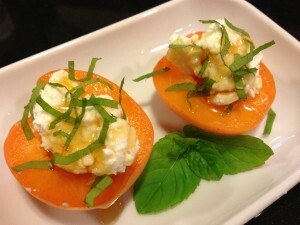 Split them open and toast them under the broiler. 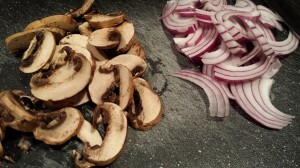 Slice some mushrooms and onions. 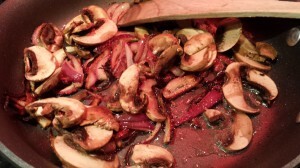 You can add bell pepper and omit the mushrooms and/or onions. It’s all about what you like! Saute the mushrooms and onions in a non-stick skillet with a bit of canola oil until the vegetables are soft and slightly caramelized. 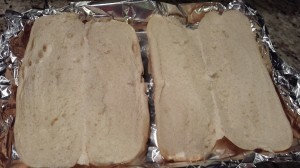 Don’t use too much oil, or your sandwich filling will be too greasy. 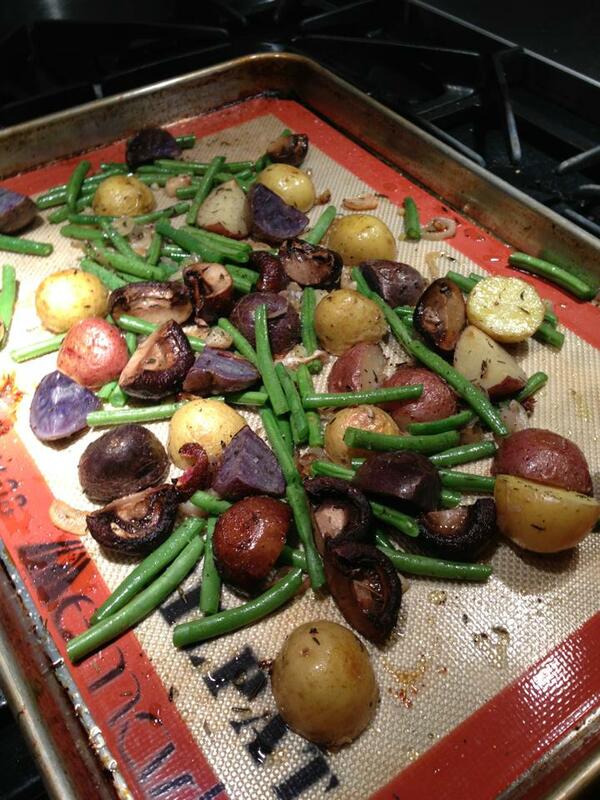 Remove the mushrooms and onions from the pan and set aside to keep warm. I like to use a good sliced steak for this recipe. 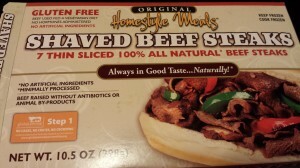 Whole Foods Market carries the Homestyle Meals brand of healthy all natural antibiotic-free sliced steaks. Homestyle Meals brand is a part of the Lou’s Naturals family which also includes Wellshire brand. Chop up the steaks. Saute the steaks in the same non-stick pan until they are browned and cooked through. Add the mushrooms and onions back to the pan, and warm through. 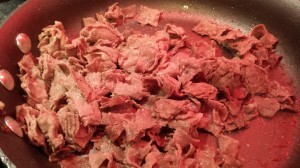 Separate the meat mixture into two parts. Then add your favorite melty cheese on top of each and let it melt to perfection. I used white American cheese on my half, and Swiss cheese on my husband’s half. You definitely want a melty cheese. I don’t care for Cheese Whiz myself although you are welcome to use it. Spread some mayonnaise on the toasted steak rolls. 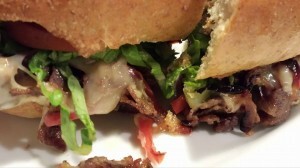 Carefully remove the meat and cheese mixture to the toasted steak rolls. 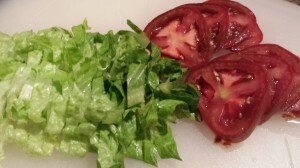 Add some fixin’s such as shredded lettuce and sliced tomato. Add some crispy onion rings or french fries. Slice the sandwich in half, and serve! 2. Split and toast steak rolls. 3. In a non-stick pan over medium heat, warm the canola oil. Saute the onions and mushrooms (and optional bell pepper) until soft and slightly caramelized. Remove the mixture to a small bowl and set aside. 4. 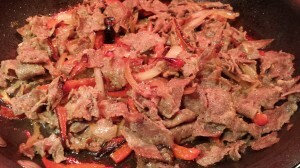 In the same non-stick pan, quickly saute the chopped steaks over medium heat until browned and cooked through. 5. 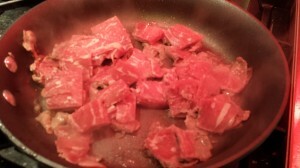 Return the onion mushroom mixture to the pan with the steaks. Stir and warm through. 6. 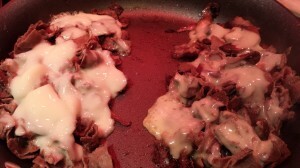 Melt the American cheese slices on top of the steak mixture. 7. Spread the mayo on the toasted steak rolls. 8. 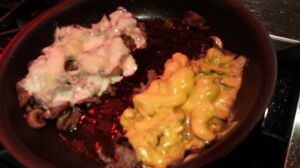 When the cheese is melted, carefully move the steak and cheese mixture to the steak rolls. 9. Top with shredded lettuce and sliced tomato. 10. Cut the sandwiches in half, and serve! Serves 2 hungry diners. 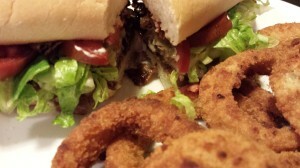 Offer with french fries or onion rings, or a healthy mixed green salad on the side. 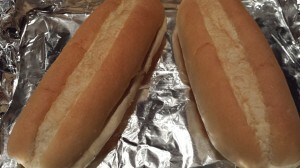 Variations: Use the chicken steaks made for cheese steak sandwiches for a lighter version. 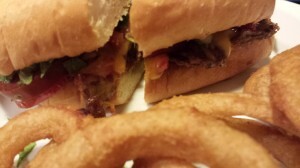 Substitute Cheese Whiz for the American cheese slices. Use your favorite melty cheese instead. Add whatever condiments that you like. 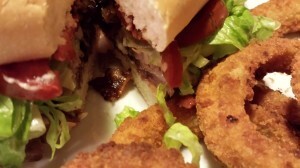 To make this a vegetarian sandwich, omit the meat and use more mushrooms.